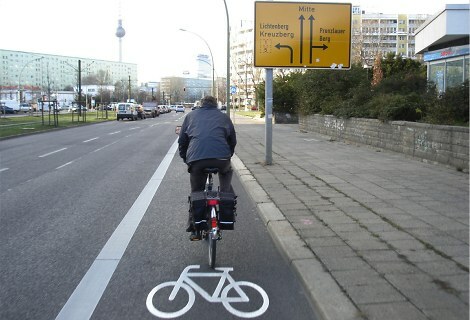 Cyclists in the City: "English streets are too old and small for bike tracks"
"English streets are too old and small for bike tracks"
"In Germany the streets and roads are much wider. I think the point made by someone above that English streets are just too old and small is justified, therefore no cycle lanes and accepting cyclists as normal part of traffic just as motorbikes is the way to go for England." You hear this kind of claptrap spouted all over the place in the UK. Since when did Germany not have old roads? Or narrow roads? The City of London is particularly keen on telling us how its narrow streets can't be changed and how that impedes better solutions for cycling and walking. It's complete rubbish, of course. Here are two people cycling down a road in Goerlitz. You'll notice that because it's in Germany, the road is both brand-spanking new and extremely wide. Apparently. What you won't notice is there are no cars, of course. Nor will you notice that the road is probably a 'Fahrradstrasse'. They exist all over Germany. Drivers are usually allowed to drive motor vehicles on them if they live there but not if they don't. Don't live here, don't drive here, basically. But you can walk or cycle. And, if you're eight years-old or under, you must cycle on the pavement. You might notice one of the cyclist doesn't have a helmet. Our Guardian reader quoted above thinks we people on bikes should pretend we are like motorcycles. My grandmother used to cycle about in a skirt when we were in Germany together. She wasn't very fast. Actually, I'd say she' was about as fast as a very small hamster, or thereabouts. I don't think she was pretending to be a motorbike. But she liked it that way. In fact, she used to cycle in England too. But then again, so did all her friends. The point is, that it's not about the roads being old or narrow. It's about how the politicians set an agenda that enforces safer and, frankly, more pleasant urban environments for people who happen not to be inside a motor vehicle at the time but might be on foot or on a bike, or in a shop or office. It's nothing to do with the age of the road layout or the width of the roads. Germany's roads are no different to the roads in the UK.If anything, the massive investment our last government put into roads makes our road network probably more modern and swish than large parts of Germany's in my view. But let's have a look at some of London's narrow, old streets and compare a typical London scene with Berlin. Here's London's Victoria Embankment again. Two or three lanes and a spot-the-bike-lane intelligence test. Compare and contrast London vs Berlin. Here a two-lane road plus clearly indicated bike lane heading towards Alexanderplatz. I cycled along here a few weeks ago. It's not the best bike lane on the planet. But it works. You don't need to sit behind some giant HGV and worry about whether it might crush you because you have your own road space to make use of. And the HGV knows it must keep out of your biking space. Nothing like the Victoria Embankment, which is a similarly-sized street to this one in Berlin. Meanwhile, let's remind ourselves what a typical old and narrow road might look like in the City of London. London. Far 'too old' and far 'too small' for safe and secure cycle infrastructure. No space at all in fact.